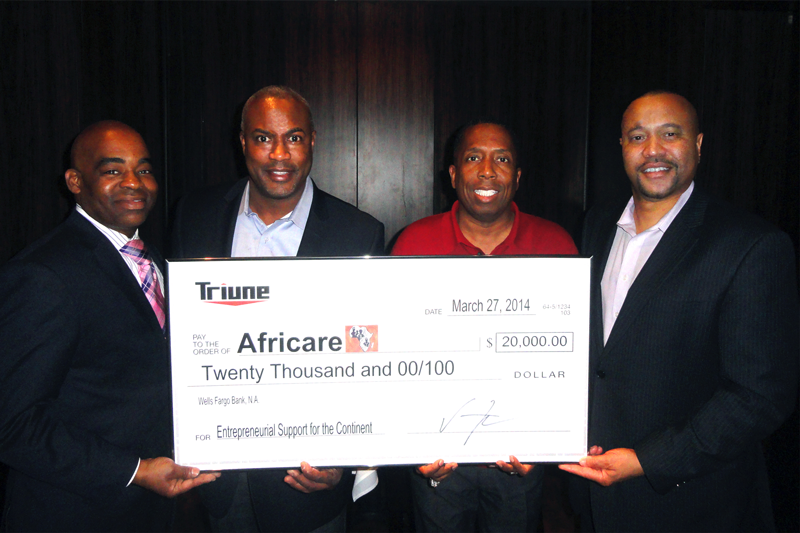 Triune donates $20,000.00 to Africare on March 27, 2014. For more than 40 years Africare (www.africare.com ) has been on a mission to improve the quality of life for the indigenous people of Africa. Africare is a Non-Profit 5013c committed to addressing poverty and hunger through building better communities. Vince Fudzie Managing Member of Triune along with TV / Radio personality Gary with the “T”, Lloyd Facen and Daryl Wallace are presenting the check. For more than 40 years Africare (www.africare.com ) has been on a mission to improve the quality of life for the indigenous people of Africa. Africare is a Non-Profit 5013c committed to addressing poverty and hunger through building better communities. Triune is making this donation because we believe that micro-philanthropies such as Africare are uniquely effective in helping to bring people out of poverty. The micro-philanthropy model is based on small, direct interactions between “helpers” and “doers.” This finer level of granularity provides greater potential for feedback. It also uses the definition of philanthropy as “love of humanity,” which is broader than just donating money. This opens up a broader range of activities such as volunteering, emergency response activities, mentoring and many other patterns of altruism. This simple model of directly placing dollars into areas of need is having a profound impact on “bringing hope to where there is despair.” It is also an economic multiplier for positive change in these disadvantaged communities. We believe that strategically investing dollars directly into these under developed communities and providing fishing pole rather than only fish is more economically sustainable to get these communities healthy. There are so many awe-inspiring stories of individuals and communities who have started with basically nothing and, together with organizations like Africare, are building more productive communities and changing the landscape of their existence. One in particular is the Cooperatives and Agribusinesses in South Africa that are growing food for enterprise by leveraging other local products, services and infrastructure that were directly supported by Africare’s Micro-philanthropy. As an enterprise-minded business, Triune fully embraces micro- philanthropy for the “love of humanity” as an important model to effectively help people in developing nations. We applaud Africare’s leadership and commitment to excellence and are excited to contribute to their mission. Go to www.africare.org and explore how you can help!